Use the Interactive Map search function to identify potential map coverage at a precise location (this method may not identify “insets” that are not shown on index maps). 1. Enter an address, Lat/Lon, or navigate to the location of interest. 2. Click on the map to place a marker and generate the list of map publications that may provide coverage at that precise location or nearby areas. Clicking on a different location on the map will result in a refreshed list of map publications that may provide coverage at the new location. If there are no map publications for your location, you will see a message at the bottom of the map and no publications will be listed. Use the Place Name Search to find map publications for a city, county, or other place in the selected state. This method is best for identifying “insets” that are not shown on index maps. Place names include historical names for cities and towns, neighborhoods, unincorporated villages or other populated areas. This search method produces a list of all publications that may provide coverage for the Place Name you have entered. Choose the Place Name (City, County, or Site) from the second drop-down menu. Oftentimes a map publication will contain sheets or “insets” (sometimes called “Specials”) that are not depicted on index maps. This is typically because they are located far enough away that it isn’t practical to show, or were added after initial publication. Isolated areas depicted in these insets may be located 10 miles or more away from the main coverage area. 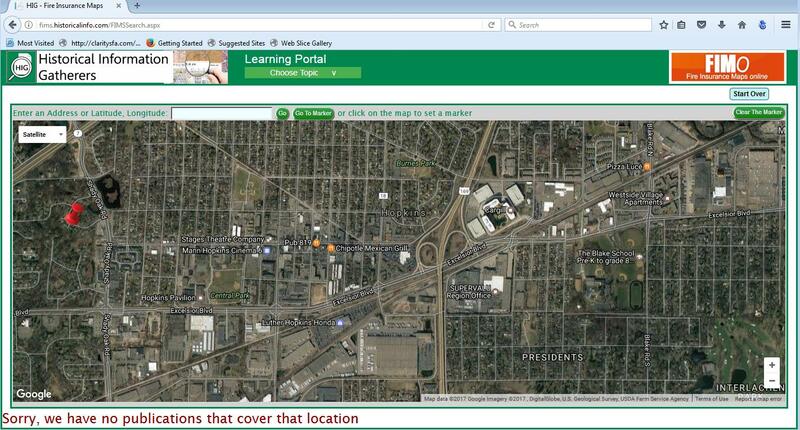 FIMo may not identify this coverage, especially using the Interactive Map search. When is it appropriate to do extra detective work to try and identify coverage? When it is known or suspected that a facility or a developed area existed at the time the map was made. Out of town factories, resorts, hotels, gas stations, railroad depots, and more may have been mapped. Undeveloped areas and outlying residential neighborhoods are unlikely to have been mapped. 3. Once a publication of interest has been identified, click the link to view it. Most publications in this collection have multiple sheets. 4. 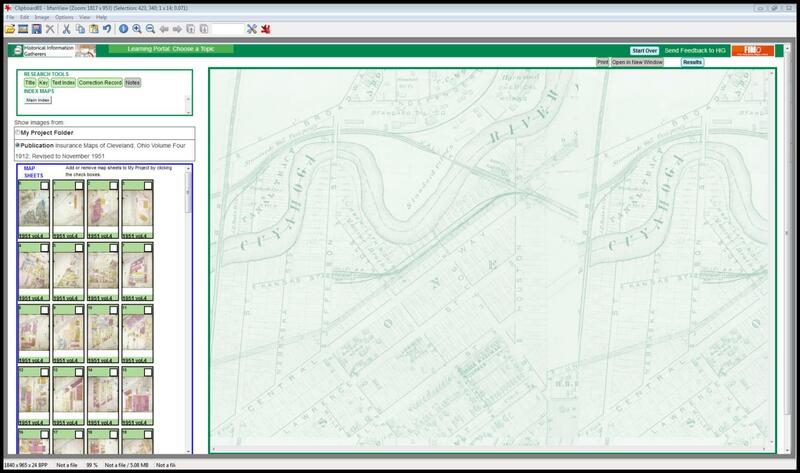 Use the Text Index or Index Map to identify which map sheets depict an area of interest. Some publications do not have these features and you may have to browse the sheets for coverage. Fortunately, this usually occurs when there are only a small number of sheets. 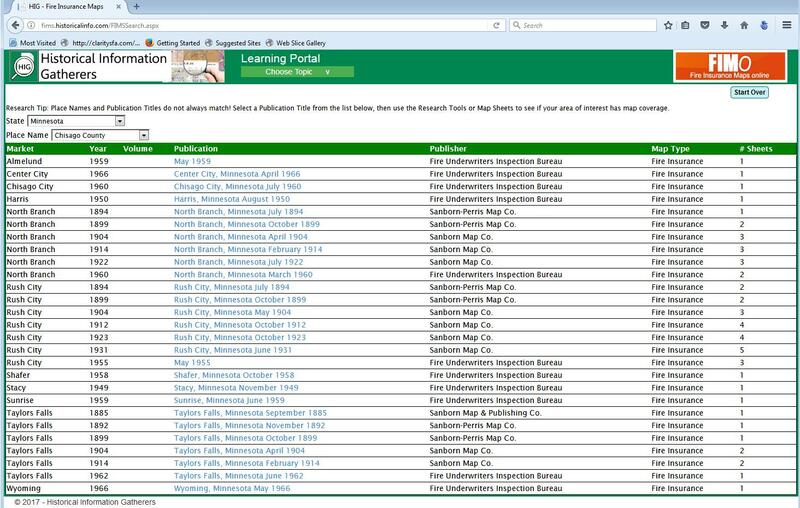 The Research Tools section of the Sheets Page may contain edited images showing the Title, Key, Text Index, Correction Record, Notes, and Index Maps for the publication. If you are visually oriented, checking the Index Map may be the preferred way to find which sheets depict the area of interest. 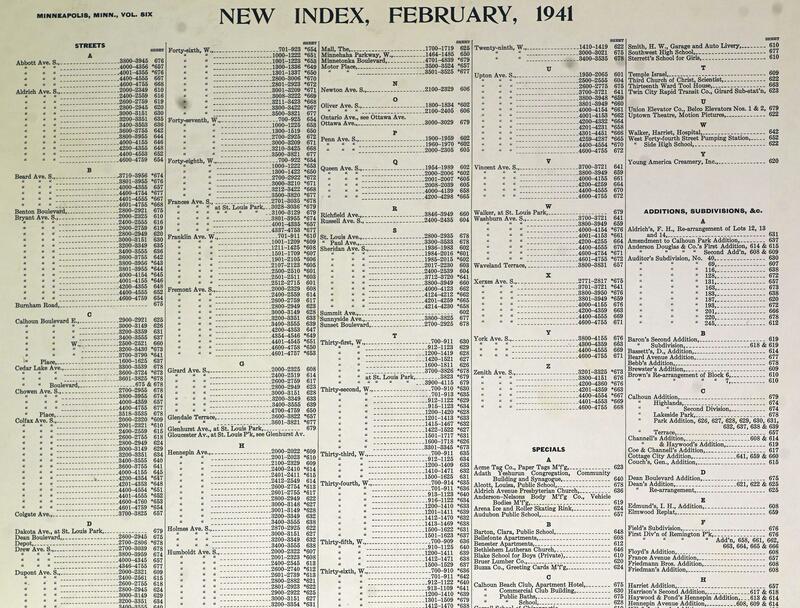 Simply find the site’s location on an Index Map, then identify the sheet numbers. 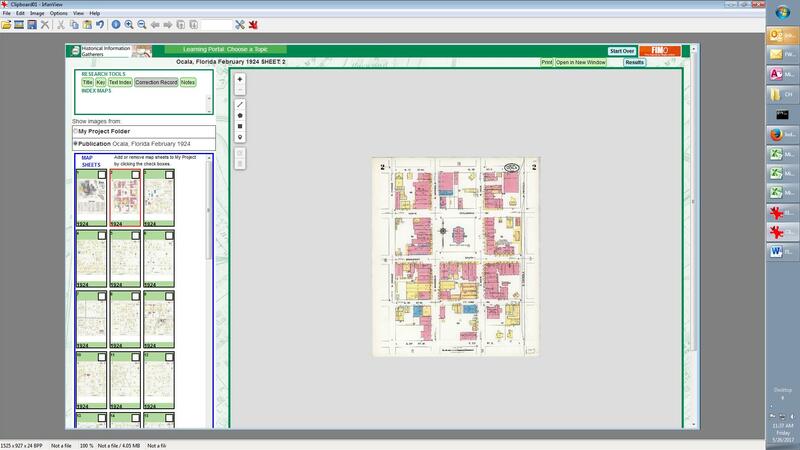 Original index maps can be found on the Map Sheets, but Index Maps in the Research Tools area have been enhanced with modern street overlays. 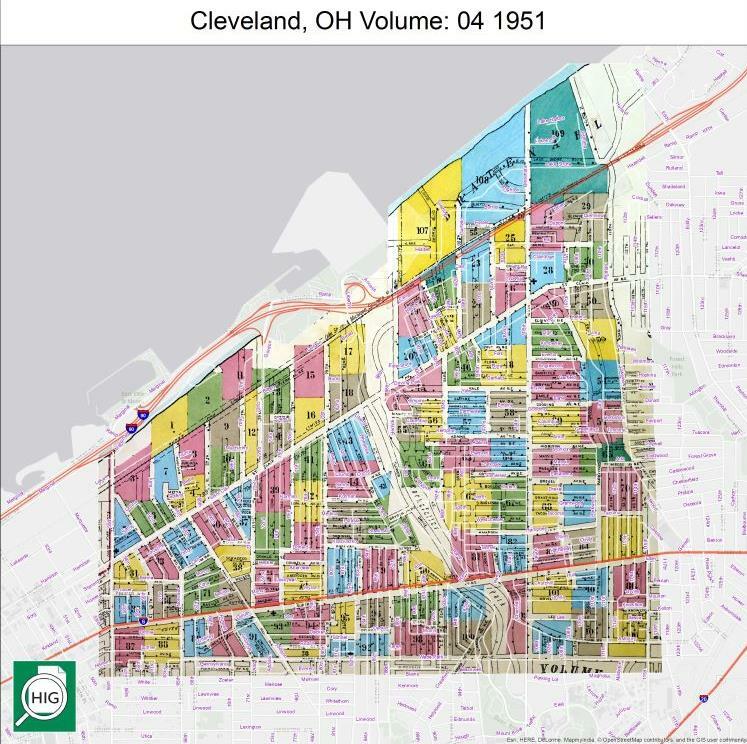 Original index maps have been overlaid with a modern street map to make research easy. Use the Text Index to look up using an address, facility name, or in some cases the Addition or Subdivision name. There may be more than one Text Index in the Map Sheets. If available in Research Tools, all Text Indexes have been combined into one image. Mapped areas not shown on Index Maps can usually be identified by using the Text Index. The Street Section allows for an address lookup. Keep in mind that street names and address ranges may have changed over time. The Specials section lists facilities of special interest by name. The type of facility is usually noted as well. Scanning the list of Specials for a type a facility is a good way to check if the name is not known. 5. 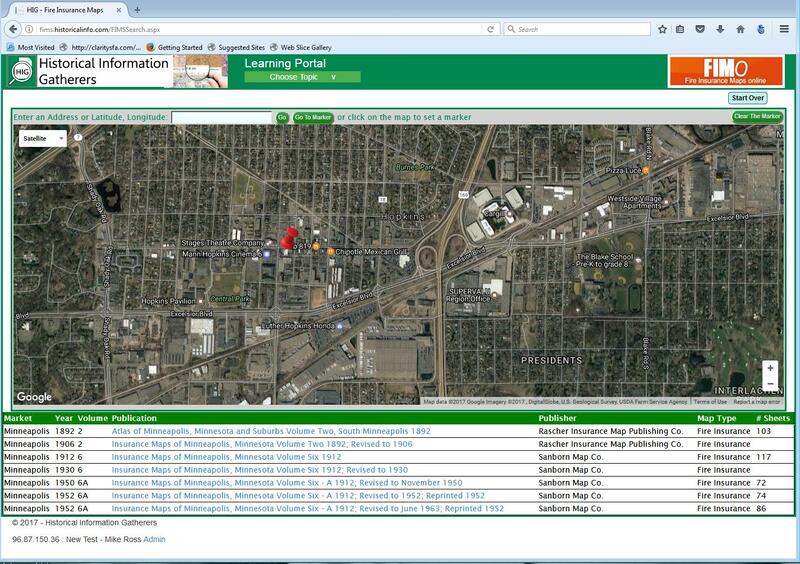 Click on the desired Map Sheet to display in the browser.